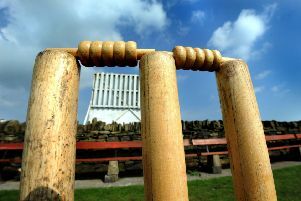 An immense game between two sides fighting relegation saw Blyth edge visitors Kirkley by 12 runs. Blyth lost the toss and were put in, with Rowell and Carr opening. The first wicket fell when Ball bowled Rowell for 14, which brought skipper Lawrence to the crease and he scored 18 off four balls. With the score on 44, Ritchie caught Carr off Ball for six. Hudspith was next in and he was caught at deep point by Moon for six off Singh. Glass was next in but was trapped lbw by Moon without scoring. Normally Blyth’s middle order flounder, but this was the week they hit back. Lawrence brought up his 50 from 52 balls in 103 minutes. Smith got in on the act, hitting two fours from Turnbull. However, Turnbull got his man when Farrelly caught Smith for 21. With Lawrence he had put on 40 for the fifth wicket. Purma and Lawrence had put on 35 before Nicholson he had the former caught for 15. With the score on 180, Lawrence went for another big shot and was caught by Nicholson off Moon for 86. His knock included five fours and five sixes from 72 balls in 135 minutes. Ex-Kirkley player Burns was next in, and with Roberts the pair added 57 for the eighth wicket. Nicholson ended the stand when he trapped Burns lbw for 26 before Walker joined Roberts and the pair saw out the overs. Roberts remained 36 not out and Walker unbeaten on six. Kirkley’s bowling figures were A Ball 1-27, C Smith 1-68, R Moon 2-74, J Singh 1-10, J Turnbull 1-18 and M Nicholson 2-43. In reply, Kirkley had moved onto 36 at the end of the fourth over before Roberts finally made a breakthrough when he bowled Ball for 16. Spinners Walker and Lawrence slowed the run chase down, but it was still six an over. Nicholson brought up his half century with a four off Walker in from 47 balls before Lawrence trapped him lbw on 54. Farrelly had pushed the score up to 143 when Lawrence struck again when sub fielder caught Smith for four. Farrelly reached his 50 from 76 balls. However, with the score on 169, Lawrence trapped Douse lbw for ten. Lawrence then removed Farrelly for 62, which included six fours and two sixes from 104 balls. Roberts took a great catch on the boundary to send Ritchie back for 13 off the bowling of Hudspith. Ball came in next and left without scoring when Roberts had him caught by Smith. Moon was living dangerously when he was trying to gain extra yards back up at the bowler’s end. He was warned twice and this became his downfall when Smith called for a single. Moon was slow to respond and was run out for 20. The score was at 230 with just two more wickets for a vital Blyth victory. Smith was trapped lbw by Roberts for six and Turnbull lasted three balls when stand-in keeper Glass took a one handed catch to win the game for the home side. The win lifted Blyth out of the drop zone. Blyth bowling figures were P Roberts 4-60, R Burns 0-34, C Walker 0-63, M Lawrence 4-32 and K Hudspith 1-25. On Sunday Blyth first XI travel up the A1 to play Berwick with a 1pm start. Blyth seconds are at home against Howick and Alnmouth at 1.30pm.